High power 12 volt to 16 volt DC/DC converters at low cost. Suitable for voltage stabilization of automobile electronics, special purpose UPS, etc. Sometimes you need 16 volts in a car or bus, or from a 12 volt battery, and these DC/DC converters are a good way to get it. These are Boost Converters that have fixed output of 16VDC. You can specify any output voltage from 13.8 to 16 volts with a minimum order of 20 pieces. They closely regulate the output voltage over a range of input voltages. The two sets of output terminals are connected together, you can draw all the power from one or the other. There are two sets of terminals for convenience in case you want to run more than one piece of equipment. 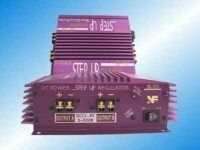 Inexpensive high current DC/DC converter regulates and stabilizes voltage in automotive applications. Also can be used to provide regulated 16 volts from a sealed lead acid battery--excellent for special purpose UPS DC battery backups. 12 volt to 16 volt Power converter regulator.